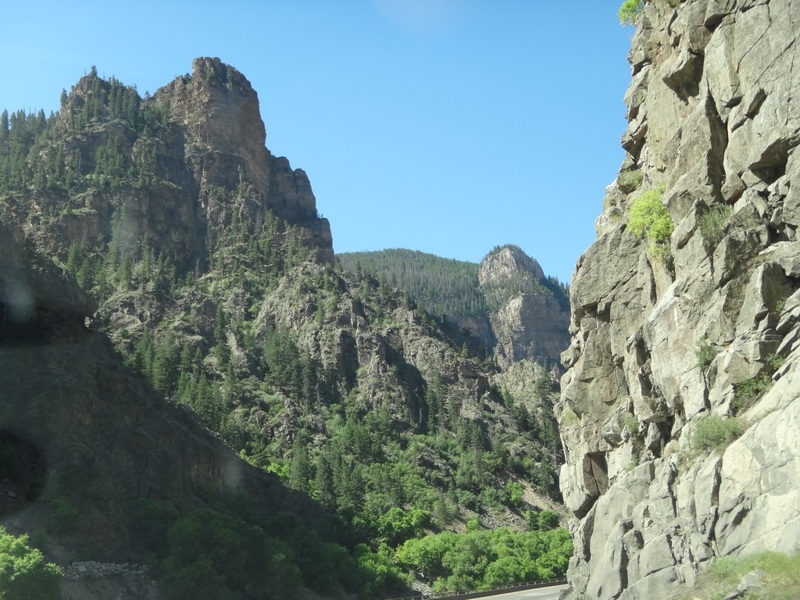 Photograph 1 - Passing through Glenwood Canyon near Glenwood Springs, Colorado. Photograph 2 - The beautiful Colorado River near the small town called Rifle, still in Colorado. 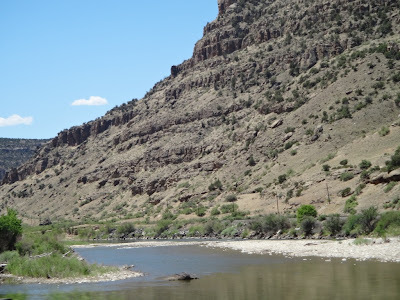 This mighty river eventually flows into the Grand Canyon a few hundred miles from here. 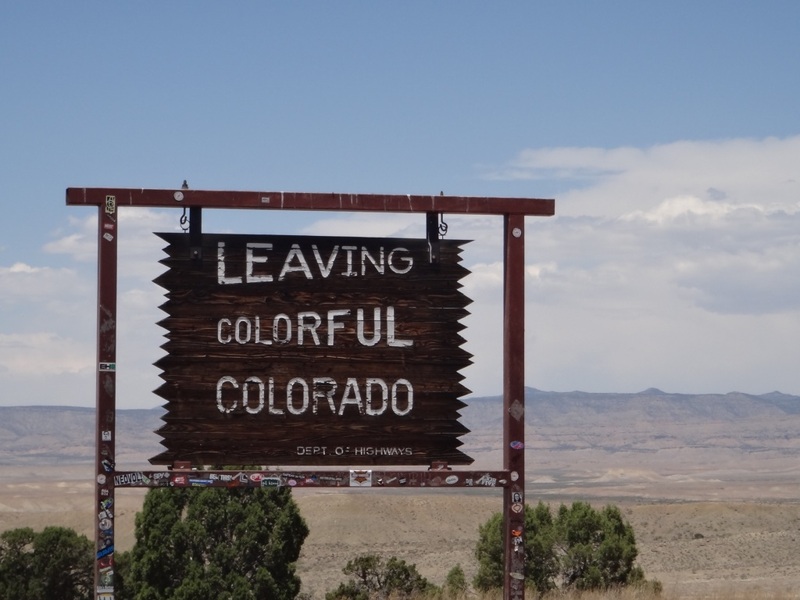 Photograph 3 - Leaving Colorado - amazing how the countryside changed from alpine, pine forests, slopping plains and desert as we entered Utah. 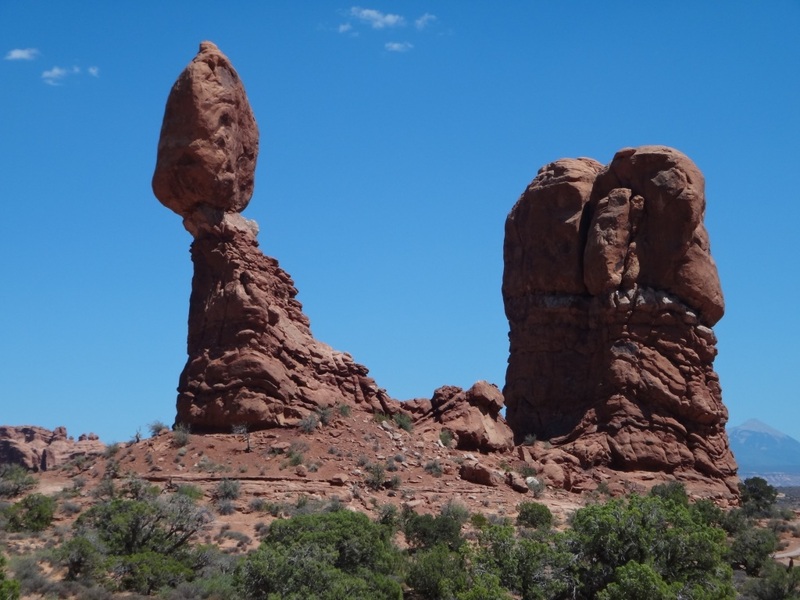 Photograph 4 - The Balancing Rock just inside the Arches National Park, Utah. 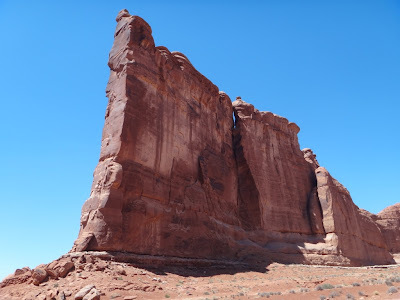 Photograph 5 - A panorama view of Park Avenue inside the Arches National Park, Utah. 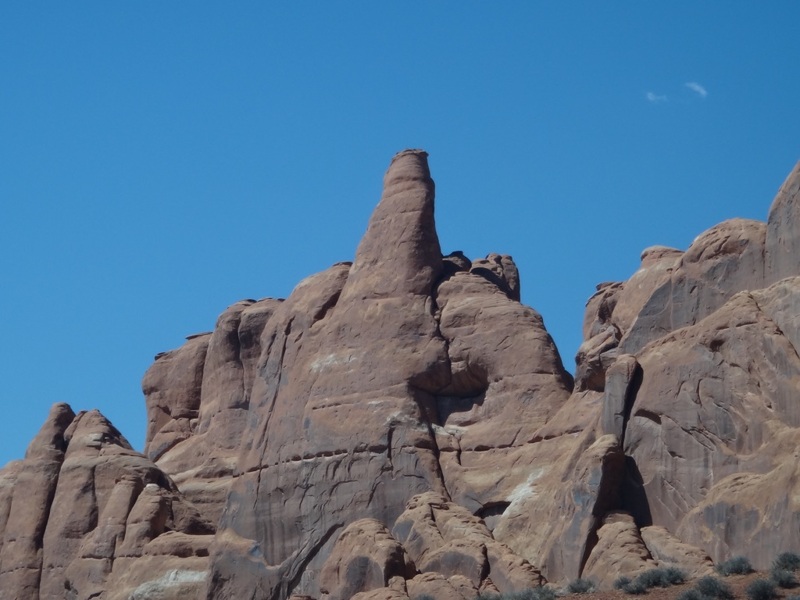 Photograph 6 - The Organ Pipes inside the Arches National Park, Utah. 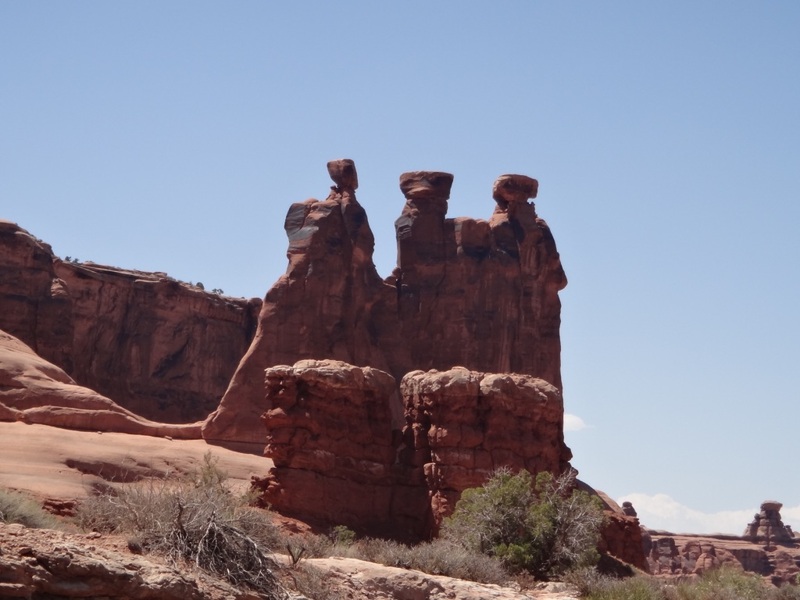 Photograph 7 - They call this the Tower of Babel, inside the Arches National Park, Utah. Photogragh 8 - Another but more magnificent Balanced Rock, Arches National park, Utah. 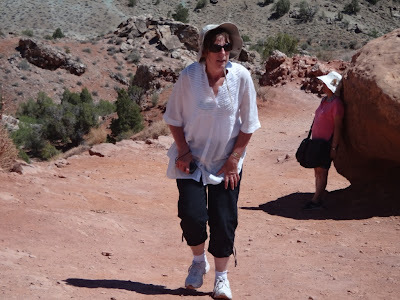 Photograph 9 - Anne just made it to the Delicate Arch Viewpoint under 101 deg F heat, Arches National Park. Photograph 10 - The highlight within The National Park - the Delicate Arch - note the many little spots inside the arch - they are hundreds of walkers who undertook the three mile journey to touch this Utah icon. Photograph 11 - Formations near Skyline Arch - we guess that "the bird" was not directed to us! "Sit on that and play fair" an old injun saying!! 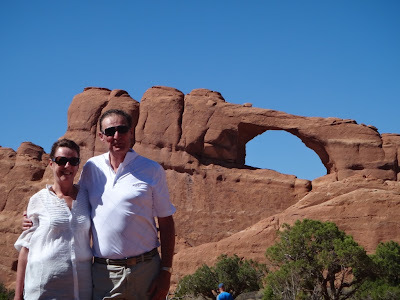 Photograph 12 - Somebody volunteered to take our picture at the Skyline Arch. 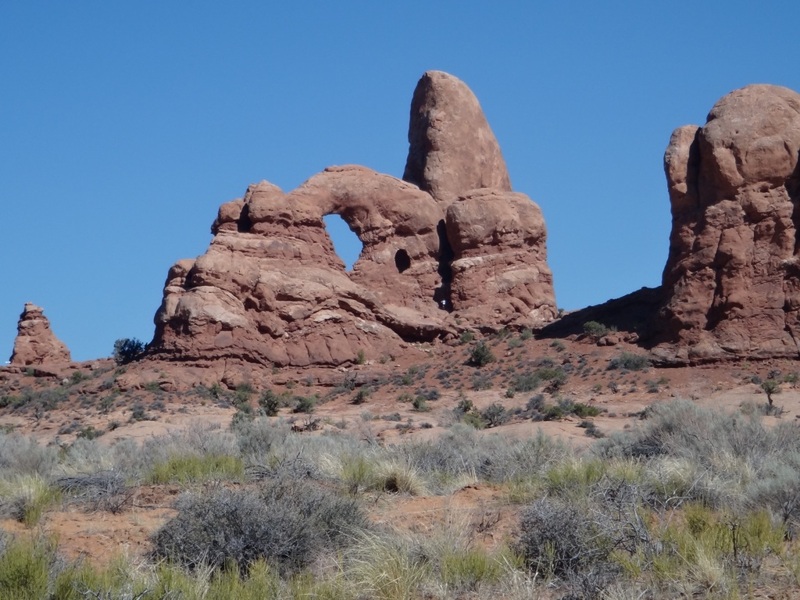 Photograph 13 - On the way back down the Arches National Park a turnoff directed us to the Double Arch - this is one of them. We took heaps of photographs today. 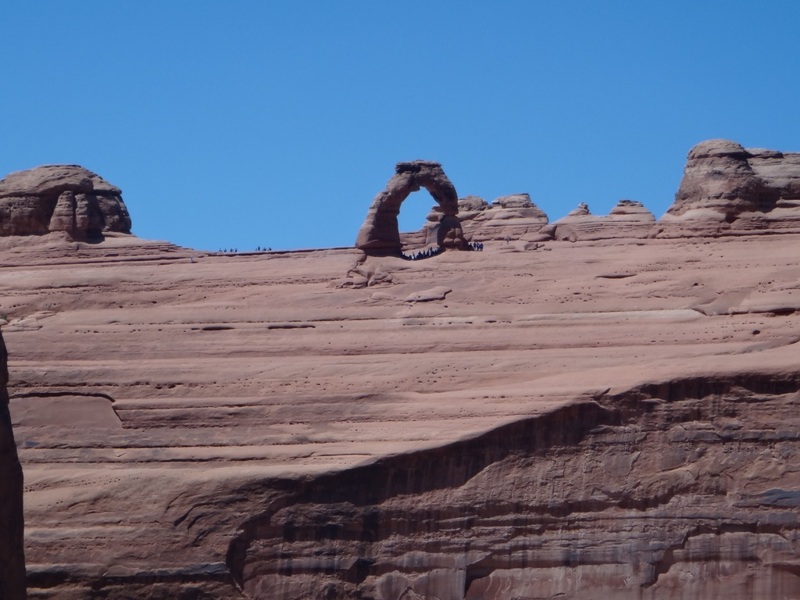 Mostly within the Arches National Park in Utah. We sadly left our great Winter Park Lodge at 8am. We discovered that our particular accommodation is owned by the "Erichsons" who use their place during winter and hire out to people like us during the "off" ski season. We had all the conforts of home, HD LCD TV, videos to watch, our own personal Wifi and many other creature comforts. We were sad to leave this as it was a good respite from hotels. 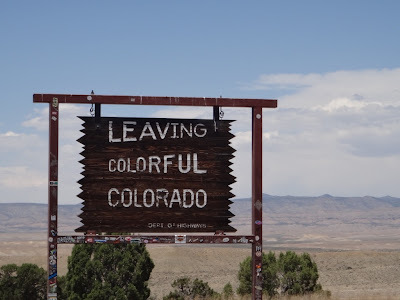 After travelling down the Rockies to the 75MPH (120KPH) limit expressway westward we noticed the countryside dramatically changed from an alpine environment, to a forested landscape with deep canyons, to sloping plains and finally entering a dry desert once we reached Utah. The temperature increased from 49 deg F (cold) to 101 deg F (summer hot) during the onset of the day. We passed through a place called Glenwood Canyon - this spectacular piece of Colorado countryside goes for about 30 kilometres and follows the Colorado River - and wow!! How beautiful was this - nothing like it in Australia. We will have this experience in our memories for a long time. The canyon is deep and extremely narrow. We had lunch at a park in a town called Fruita near the Colorado/Utah state line and a few hours later we made it to the entrance of the Arches National Park at 2:30pm (after travelling nearly 600 klms). There is a 18 mile road that go into this park and at the end you turn back the same way to exit. The entrance/exit is only 10 klms from our overnight destination of Moab. 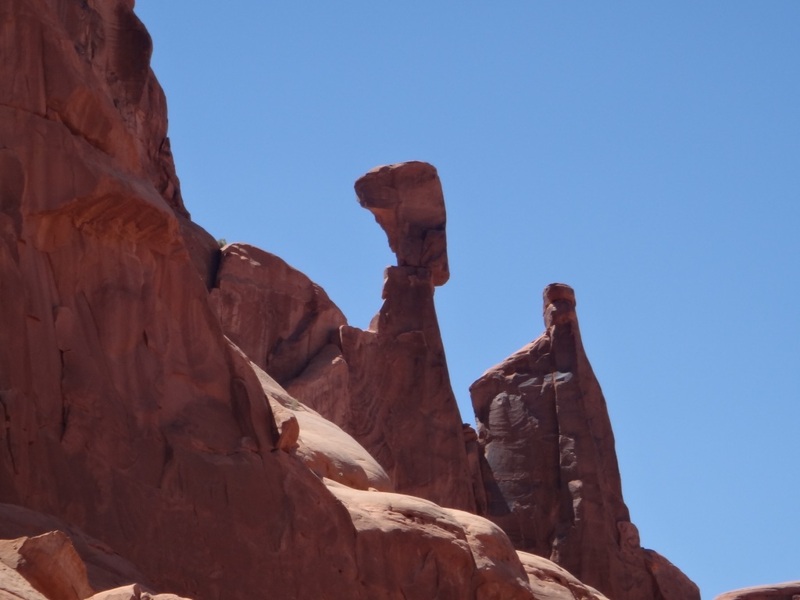 Now about the Park - as you can see from the many photos above there are plenty of different rock formations. Many western movies, including many John Wayne movies were taken inside this park. Anne stated that in his youth Neil would have taken photos of girls, now he takes photos of rocks!!! How the years do change a person. The Arches National Park is highly recommended to visit if you are in Utah. The scenery is unique and extremely unusual. Tomorrow we are to a place called Torrey - still in Utah and not far from Moab. It should be a three hour drive. On the way we will stop at the Canyonlands National Park and Capitol Reef National Park near Torrey - it should be an easy day....cheers. PS: We still haven't seen any bears yet - seen plenty of chipmunks!!! !